Tibbals has handcrafted nearly 1 million pieces to make up his miniature circus, including 1500 performers, 152 wagons, 7000 folding chairs for spectators, and dishes and tableware to serve 900 people. Tiny fully equipped train cars, historic wagons, a four-foot-high big top, 500 circus animals and thousands of other items comprising a 3,800-square-foot, 1/16th scale model three-ring circus are being unpacked and installed at the Tibbals Learning Center. Housed at the Ringling Circus Museum, on the grounds of the John and Mable Ringling Museum of Art, Sarasota, the entire complex is administered by Florida State University. The magnificent model of the American Circus—dubbed the Howard Bros. Circus—and the building where it is being installed are the gift of Howard Tibbals, who created what has been called "a magical world more than 50 years in the making." The project's seeds were planted in Tibbals' imagination during his childhood when he watched the circus roll into town. Tibbals has handcrafted nearly 1 million pieces to make up his miniature circus, including 1500 performers, 152 wagons, 7000 folding chairs for spectators, and dishes and tableware to serve 900 people. With plans to unpack two cars each day, full installation of the circus, which began in mid-July, is a massive undertaking expected to take months to complete. The Tibbals Learning Center—built with a $6.5 million donation from Tibbals, the retired head of a successful flooring company—is scheduled to be completed in January 2006. Tibbals was on hand to unload the first car, a red boiler car complete with tiny pots and pans, buckets and muffin tins. The boiler car and other cars containing equipment needed to feed the animals and workers were always the last cars loaded and the first unloaded on any circus train, Tibbals said in an interview. "They needed to feed everyone. The water was especially needed for the animals," he said. "And to wet down the grounds, if they were dusty." 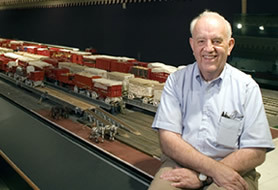 Tibbals and his volunteer helpers at Ringling will unload the tiny circus train in the same order as its life-size counterpart. The model represents the Ringling Bros. and Barnum & Bailey Circus during its Golden Era, 1919-38. To assure historic accuracy, Tibbals collected almost one million photographs and measured historic wagons, train cars, and other circus equipment to construct his model at a scale of 3/4 inch to a foot. The perimeter of the model is approximately 450 feet, or the length of 1.5 football fields. The area is large enough to park 11 school busses. Upon completion at the Ringling, this installation will be the first time Howard Tibbals will ever see his life's work completely assembled as he has so long envisioned it. The Tibbals Learning Center was built with the gift from Tibbals in 1999 and matching grants and gifts. Tibbals, the former owner of Tibbals Flooring Co. in Oneida, Tenn., northwest of Knoxville, also owns a home with his wife in Sarasota. Educational opportunities abound at the Ringling properties, and several graduate students from around the country are spending the summer working as interns on projects related to the opening of the Tibbals Learning Center.